Hey! It’s me! 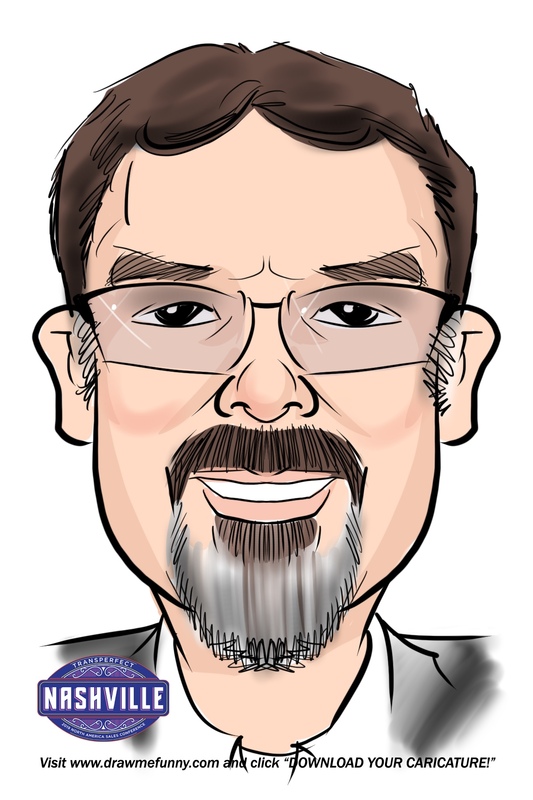 Or, at least the conference caricature version of me. Hello! I’d guess, for most parents, to our kids we’re merely caricatures of our real selves, anyway. But that’s mostly true of the myriad glimpses different people get of us as we rotate through various circles: work, church, after-school activities, the neighborhood, and not to mention (but I just did) social media. So with whom do we wear our real face, anyway? It’s more like faces. And trying to imagine what version of ourselves haunts the realities from another’s perspective is probably as futile as forecasting the us that will look back at ourselves from the mirror months and years from now. As related in an earlier post, I have only a passing acquaintance with a comb, and probably the best way to capture any essence of me is live, in motion. Or maybe that’s just an evasive way of admitting I’d prefer not to be photographed at all. Still the evidence exists, on film and on paper. And I had a chance to amuse myself with a stranger’s perspective of my 42-year-old features at a recent work conference in Nashville. My company had set up a booth outside the main presentation hall and we were invited to sit for caricatures between sessions. Hey, it beats the ordinary mugshot or professional headshot, I gotta say. And is maybe a cut above the various ways we can “emoji” ourselves online. It got me thinking of the various ways I’ve been sketched in the recent past. By my son, Jonah, throwing me on a pot of gold around St. Patrick’s Day 6 years ago, along with an attempt at spelling my then company’s name. LOVE THAT ONE. 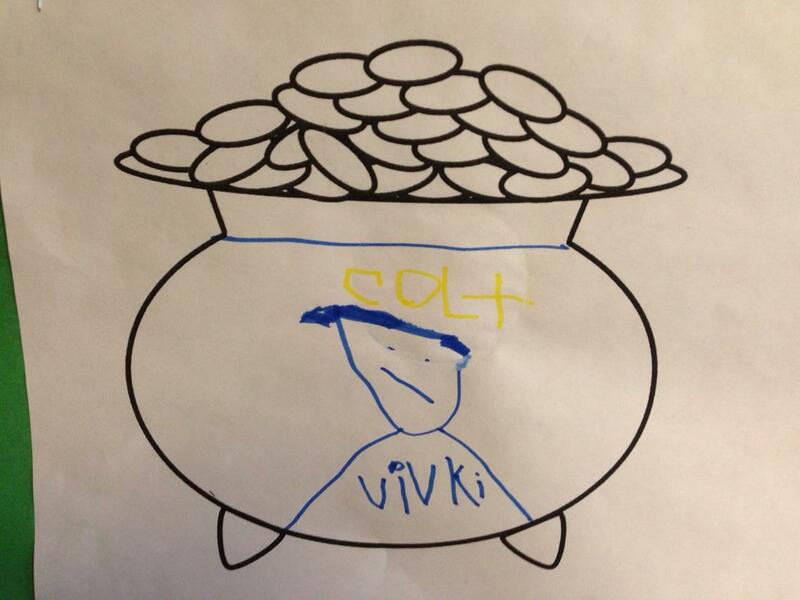 Thanks to my (wonderful) son, I’m on a pot of gold! Circa 2013, by Jonah Foutz. Or, in the midst of my three-year run as snarky columnist laying out the rules of the road — and the gray areas — in a weekly driving column in the Naperville Sun, a colleague graphic designer sketched out a pretty prescient version of me, anticipating the looming borders of my hairline. The sketch never made it into print — a standard mug shot with a nonstandard flipped-up collar on my thriftstore shirt at the time did. But the sketch resurfaced, opportunely, at my 30th birthday party with a fitting nod to my driving over the hill. Stuck to a Sun ruler, natch. But stealing the show, and my heart, are Mom and Dad. For me, they’ve been the foundational blend of art and science in my life since, well, my life began. She’s an artist and art teacher. He’s a salesman and consummate craftsman, whether refinishing his own furniture, patenting designs for handmade knife boxes, carving chess sets, making award-winning wine, you name it. Through the magic of genes their influence has found its way into my music and writing and profession. That’s the nature of it. The nurture is in evidence, oh, every day, even as my own kids hurtle into teenagedom. When I texted Mom and Dad the nifty caricature from the conference, they responded not ten minutes later with their own sketches — both of them — from my scrapbook when I was merely weeks old. OK, Mom and Dad. You win. Or, most accurately, I did. To have parents to record such love in their own hand and have it on hand four decades and a few years later. Pretty damn magical, when you consider the evidence behind the shy pencil strokes. A caricature of myself, huh? Not bad at all.